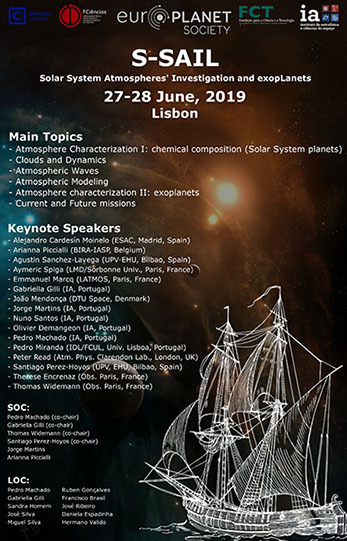 The Solar System Atmospheres’ Investigation and exopLanets (S-SAIL) workshop takes place in Lisbon, between the 27th and 28th June 2019. This workshop is supported by Europlanet 2020 RI NA1 –Innovation through Science Networking, and Fundação para a Ciência e Tecnologia (FCT), Portugal. The main goal of this 2-days workshop is to gather researchers, post-docs and students from all Europe, working on Planetary Science studies to discuss about several topics related with Planetary Atmospheres (including exoplanets), and promote collaborations on the basis of a interdisciplinary approach. Regular registration fees will be 100 euros by wire transfer (103 euros by credit card) for students and 130 euros by wire transfer (133 euros by credit card) for others (until 27th May 2019). Late registration fees will be 150 euros by wire transfer (153 euros by credit card) for students and 180 euros by wire transfer (183 euros by credit card) for others (until 7th June 2019). Abstracts (one page included figures and references, in pdf format, using this template) of contributions should be sent to the organizing comittee S-SAIL@oal.ul.pt until 15 May, 2019, indicating preferences (talk or poster). The final decision will be taken by the SOC. A limited amount of funding is available for PhD students and postdoc who cannot fund their own travel. The grant is up to 400 euros and it includes registration fees. To apply, please fill this form and send it by email to the organizing comittee S-SAIL@oal.ul.pt (until 29th April 2019) stating: an estimate of the amount of funding required; status (student, postdoc etc. ); and approx. 2 sentences on how your research will benefit from attending this workshop.